Inside your neck are your neck bones (cervical vertebrae), spinal and cranial nerves, spinal cord, blood vessels, glands (including the thyroid and parathyroids), voicebox (larynx), esophagus, trachea, brainstem, and many muscles, ligaments and other structures. With all that it's still able to gracefully balance your head and turn, tilt and bend without damaging its vital "occupants." That's amazing because if your neck's functions are interrupted for even a few seconds you'd lose consciousness and begin to die. If you live in Greensboro, High Point, Jamestown, Deep River, Archdale or surrounding areas of North Carolina, Bailey Chiropractic of High Point, NC can help you with your neck pain. Cervix is the Latin word for neck meaning a constricted area (the uterus and urinary bladders have a neck or cervix too). Your seven small neck bones are called cervical vertebrae, numbered C-1 to C-7. Inside your cervical vertebrae lies your spinal cord, a continuation of the brain down your neck and back. Protection of the spinal cord is extremely important because an injury to it can result in instant paralysis or death. Your vertebrae are connected to each other by discs, ligaments and tendons that help give your neck its shape (the cervical curve). Between the vertebrae are openings where nerves, blood vessels, lymphatic vessels, fat and connective tissues are found. With all the neck's complexity it should come as no surprise that neck problems and neck pain are common. They may develop suddenly from a trauma such as a whiplash or fall, or slowly as a result of spinal imbalance, vertebral subluxations, emotional stress or bad posture. Damaged or irritated neck nerves can cause more than neck pain. Pain in the face, shoulder, arm, wrist, hand and fingers as well as reduced neck motion may also occur. Other problems from a bad neck and neck injuries include headaches, vision difficulties, dizziness, ringing in the ears, decreased attention span, learning and memory impairments, nasal problems, tongue and throat problems. The most serious neck problems and neck injuries - such as fracture, dislocation or severe tissue damage - can be fatal if not given emergency medical care. Most other neck problems, however, although not life-threatening, can impair your health if not corrected. 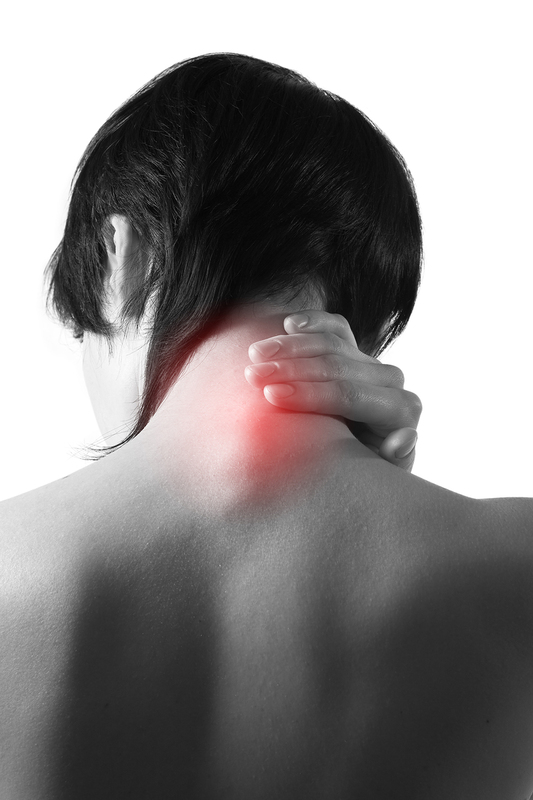 Pain in the neck can be caused by irritation, inflammation, injury or infection. Pain in the neck, shoulder, arm, hand or head "most frequently results from irritation of cervical nerve roots in the region of the intervertebral foramen, encroachment of the vascular supply as it courses through the vertebral canal, or invasion of the cord in the spinal canal. Disc herniation (or rupture) is relatively rare but can be the source of intense neck pain. Sometimes surgery is needed in this instance, especially when it's due to trauma. However, in many cases, chiropractic techniques can reestablish the integrity of the disc and prevent the need for neck surgery. These should be explored if possible. Disc degeneration is a more common cause of pain, nerve root and spinal cord irritation. Although many doctors tell their patients that the cause of disc degeneration is age, age alone cannot be blamed for the condition because it can be found even in young children. The most common causes of disc degeneration are years of spinal imbalance, spinal subluxations, and physical trauma or emotional stress. Let us suppose that one day you carried a bowling ball around for the day, but instead of carrying it closely at your side, you held it a little distance from your body. You'd get tired very fast! It's the same with your head. If it's properly balanced that's fine, but if it's held even a little off center you will start to suffer from fatigue as well as stress on your neck. If unhealthy, your neck's normal forward curve may reduce, become straight or "military", or even reverse its curve. Over time arthritic changes in the vertebrae such as lipping or spurring (boney growths); disc thinning or regeneration; or deterioration of muscles, ligaments and other structures may occur. In spite of all these changes, however, there may or may not be pain. In fact, studies show little or no correlation between the degree of pain felt in the neck and arthritic changes fround on X-rays and MRI. Lipping, spurring and other irregularities (osteoarthritis) do not in themselves constitute a disease but are rather defense mechanisms that arise to stabilize an off-balance spine. Recent research has shown that chiropractic care can reverse some of the effects of osteoarthritis - something that had previously been considered impossible. Bailey Chiropractic of High Point, NC can help. The standard medical approach to neck pain is painkillers, muscle relaxers and/or tranquilizers. If the pain doesn't subside, and orthopedic surgeon may be consulted and more drastic treatment - cortisone or other injections - may be administered. In some cases neck pillows, collars or traction may be prescribed and, interestingly enough, these constitute a tacit endorsement of the chiropractic approach of releasing pressure on the nerves, joints and foramina (openings) through which the nerves travel. But such devices, though often helpful, do not address the real cause of the problem, and some forms of traction have been criticized as damaging the meninges or membranes that enclose the spinal cord and nerves. Thus these attempts may represent a poor substitute for an actual chiropractic spinal adjustment. When should the physician resort to surgery? "As a last resort." Clearly, a patient should not consent to anything as drastic as neck surgery without first consulting another healer - in particular, a chiropractor. When the spinal bones are off center, the small openings through which the nerves travel may become narrower causing irritation to the cervical nerve roots and may also cause pressure upon the spinal cord. Chiropractic spinal care counters the effect of stress and unnatural wear and tear by relieving your neck of the vertebral subluxation complex or spinal nerve stress and restoring proper movement to the spinal column. Since most medical doctors and physical therapists are not trained to locate and correct spinal nerve stress (vertebral subluxations), an accident victim will leave the emergency room with as many subluxations as they had when they entered. Without chiropractic spinal care a neck injury might continue to cause silent damage for decades before the problem is recognized; by that time it may be too late for a complete recovery. Everyone with a spine needs to have it checked periodically by a chiropractor. Just as a periodic dental checkup is necessary to keep your teeth healthy, so a chiropractic spinal checkup is necessary to ensure a nervous system that is free from spinal nerve stress permitting you to experience greater healing and well-being. Contact Bailey Chiropractic Centre of High Point, NC today to schedule your spinal checkup. We serve residents of Greensboro, High Point, Jamestown, Deep River, Archdale and surrounding North Carolina.